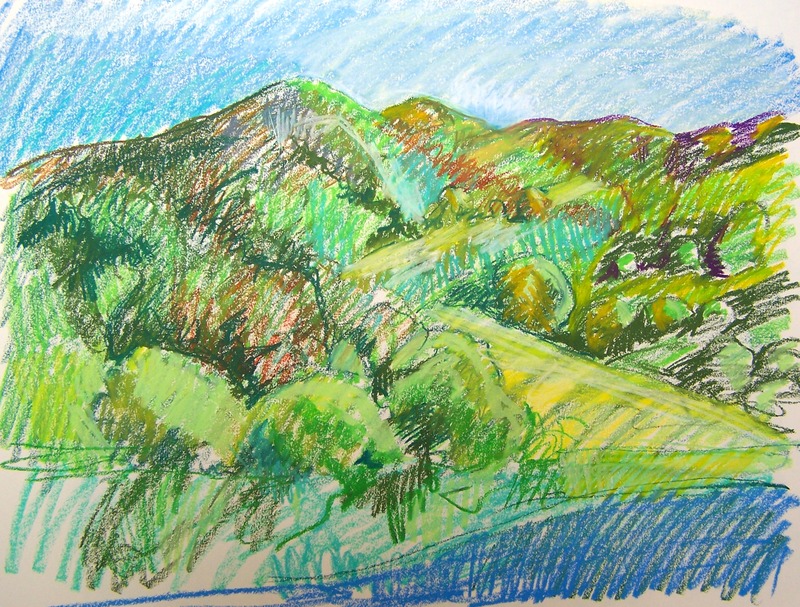 A picture of hills with fuzzy little shrubs and trees that wend their way down to a stream is the subject I’m developing in one of my paintings. I’ve been making several versions in drawings to sort out ideas. Here’s two I did today. All three pictures have as their source the same reference photo. You can look at the same image — a static photo, in this case — and create different things since there are many roads to invention. I’m even finding a new one that I know some other artists have already discovered before me: running out of supplies. I once knew a guy who used color in the most amazing way, but he was impecunious to the most unfortunate degree. Whenever he ran out of paints, not being able to immediately run out and replenish his supply, he just continued along with whatever colors he still had. The colors he achieved using Necessity as the mother of his invention was astonishing. And, now, I’m starting to run out of certain key pigments — but for some of the drawings, I continue along with what remains. More on that another day. 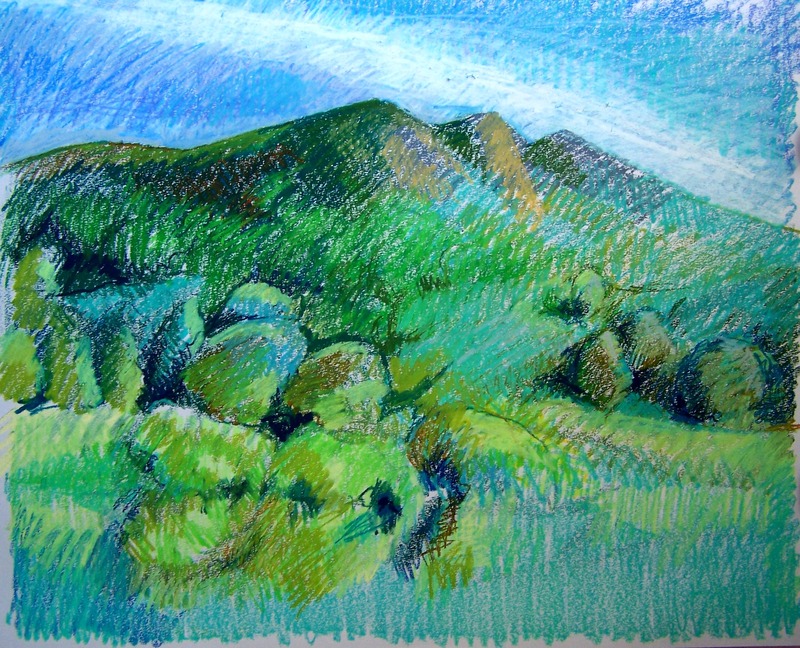 Meanwhile, a hillside looks different in a picture depending upon whether its silhouette is near the edge of the paper and achieves a different effect when more sky floats above. Similarly changes in hue or temperature affect the mood. Having many delineated, nubby little shrubs or a few generalized lumps also make one’s hillside change in personality. Many moods to find in a little hillside by the stream. Love your use of colour! Fascinating stuff – it all serves to highlight my complete ignorance of all these things. Lovely colour in the first picture. How do you decide on the one that is going to go further? I’m always pleased – and really – somewhat astonished! – at the range and quality of art right here at my fingertips. Saw your comment to a gingatao posting and came to visit. These are wonderful! I love your gestural strokes and vivid color. 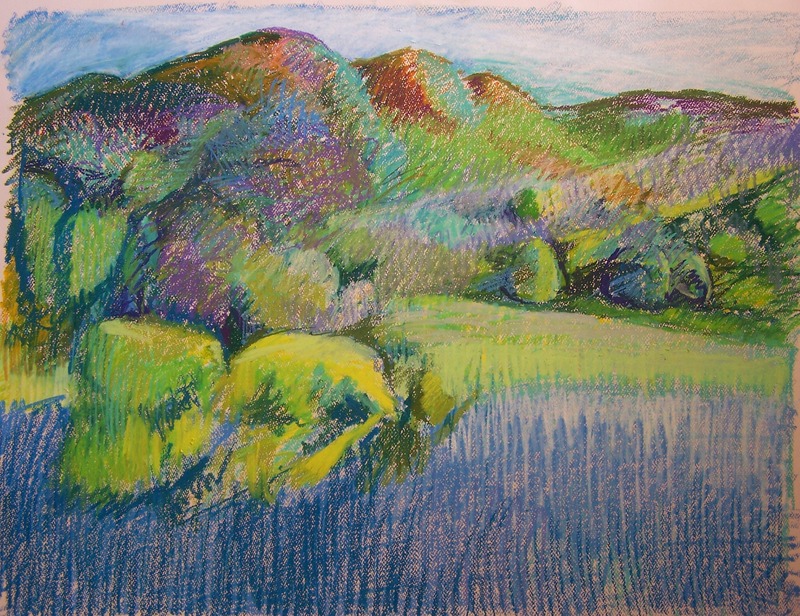 I’ve been wanting to get out some pastels for ages, and seeing your work may be just the final push I need to put aside my paints for a bit. I’m off to read (and see) more of your postings. Thanks to you all for these kind words, and to Patrice, I’m glad the post gives you encouragement to experiment in your art in the directions that you feel you should follow. Ben, it’s funny I ask myself that same question. Somehow the painting, like the drawings before it, leads in its own path. Gabrielle, if we knew what we were doing before hand, whence would be all the fun! Discovery onwards!